As we know, scarves are off the menu, but I have got really excited about knitting a little shrug this week – it’s a really pretty lace pattern from Ewetopia (don’t you love yarn shop names! ), and its knit side to side which really shows off the graduated yarn. It was all going well until my husband spotted it. No – it’s a shrug. Well to be fair you knit a big oblong and then sew up the ends so I can see his confusion. 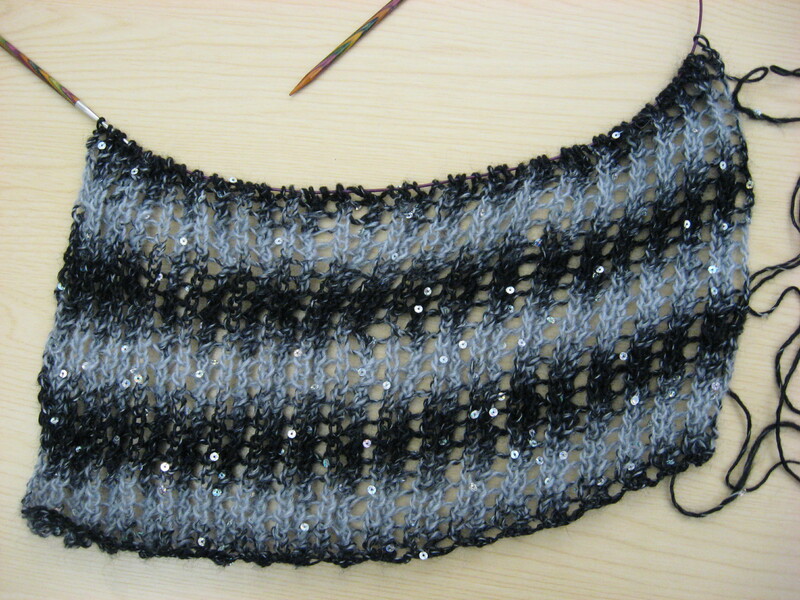 In fact I don’t understand how I have ended up knitting another oblong – even when I was really trying not to. It’s got sequins on it. Back in the office today, and the end of the holiday is truly over. The tinsel is hanging limply, decorations have fallen down over the break, the Merry Christmas sign is a little dusty and the whole place has a slightly abandoned air about it. With no decorations up at home due to decorating, I have vicariously lived my Christmas through other people’s Christmas trees and by touring houses with exciting lights on them. But essentially I have had a sparkle deficiency. This had led to a difficult period of knitting in which I have got a little over excited about knitting with sparkly stuff as I can’t decorate the house. Lots of it. Constantly. Some people can be a little sniffy about sparkly wool – in fact I remember when I first started knitting and wanted to buy a lovely (for ‘lovely’ read scratchy, sparkly, acrylic…. I know…) ball of silver. The lady in said knitting shop not only was unimpressed by this (it was her stock? Surely she bought it for people just like me?) and I ended up leaving with some blue sock wool. It’s still at the back of my box (OK, OK, boxES) of yarn. I have felt scarred by the brutal dismissal of this beautiful yarn which has gone on to attain god-like unattainable status in my eyes. But this Christmas I have shown no restraint at all. It all started with these. They are little fingerless gloves from a knitting magazine, knitted out of despair when I was stuck down south. As a one off they were quite sweet. But this was only the beginning. I then went out and bought pink sparkly stuff. I was knitting it covertly – when asked what I was knitting I would brush over the subject and say ‘oh nothing special – a scarf’ – expecting the kind of judgement I had previously expected once what i was using was discovered. When finally forced to admit what it actually was, other knitters were surprisingly supportive (at least to my face?) – which is lucky as I love it. The pattern is beautiful and so simple you can remember it and knit it without a pattern, but it’s so effective that it looks like a lot more special. It’s ‘Crest of a Wave’ – you can find it here – I will definitely be doing it again. The original pattern is in a more substantial wool, but I think that it works really well in the lighter weight and I may well be trying it over a smaller number of stitches to make a skinny delight as well. Look at how wavy it is! Did I really need it in green as well? I also decided to add beads in a fringe to the pink scarf. At least next year we won’t need a tree. I can just wear my beaded beautiful festive scarf. And for now I hope everyone has a very sparkly start to the New Year!